Logo for the ARA Explore Your Archive campaign. The Irish Traditional Music Archive (itma.ie) is a national public archive and resource centre for everyone with an interest in the traditional art forms of song, instrumental music, and dance. ITMA's Georgian Reading Room (photo: Sarah Flynn). Visit us at 73 Merrion Square S, Dublin 2, or browse our digital collections online at itma.ie. “The priest in his boots” danced by Céline & Michael Tubridy. 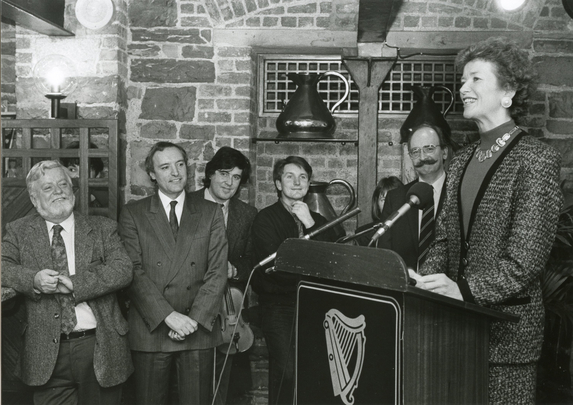 27 years ago on the 19 November 1991 the then President of Ireland, Mary Robinson, officially opened the Irish Traditional Music Archive in the Guinness Hop Store, Dublin. Also in attendance were Tom Munnelly, ITMA Chairman, Adrian Munnelly, Director of the Arts Council, Paddy Glackin, Dermot McLaughlin, Máire O'Keeffe and Peter Walsh, Director of the Guinness Hop Store. The 1960s were hairy times for Irish ballad groups like the Dubliners. The rivers of southeast Ireland were starting points on a journey that took Irish emigrants all the way to Newfoundland during the 18th century. Explore ITMA's latest digital exhibition: A Grand Time: The Songs, Music & Dance of Newfoundland's Cape Shore. Newfoundland and Ireland (map: Finnian Ó Cionnaith). Click on the map to visit A Grand Time, ITMA's digital exhibition of about the Irish of Newfoundland. Suspicion, exclusion, and conflict that sometimes mark relations between Travelling & Settled people in Ireland. The history of the ballad trade was shaped by contributions from all sides. “The royal rats of Carn” sung by Paddy Tunney. Listen to a playlist of songs from the Góilín Song Project that tell tales, tall and true, about great moments in sport. This December ITMA is shining a light on some of the great Irish music that is being made throughout the world. Starting December 1, visit http://itma.ie for your daily installment of our 2018 Advent Calendar. Here’s a little taster of what’s to come. Soomee Han, a tin whistle player from Ansan, South Korea, playing a jig, Return to Burton Road. This clip comes from a series of interviews titled Monthly Gan Ainm which hightlights musicians in South Korea who play Irish Traditional Music. Used by ITMA with the permission of the copyright holders: Soomee Han and Jongwook Choi. Soonmee Han playing the jig the Return to Burton Road.